https://d2wldr9tsuuj1b.cloudfront.net/2448/slideshows/homeMedium/Maternity%20Closet.jpg St. Eulalia and St. Gabriel Maternity Closet Open the first Saturday of each month from 10:00 - 12:00 pm. Most Rev. 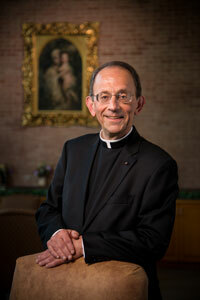 Lawrence T. Persico J.C.L. We welcome everyone to come and strengthen their faith and to grow in their love and knowledge of Jesus Christ, The Way, the Truth, and the Life. If you wish to join us at the altar in our Sunday celebration of the Eucharist, you may join our parish family by registering online or calling the parish office. New parishioners and visitors are always welcome! We are Catholic: Welcome Home!